I played and played with EQ over the weekend. Hopefully I’ll get this out of my system soon and be back to playing more with fabric! But this design is one that I will make. How could I possibly resist all that curved piecing of Winding Ways and Drunkard’s Path blocks? This coloration of it I’m calling Tiptoe Through the Tulips. Some of you may remember Tiny Tim singing Tiptoe Through the Tulips. I was giggling the whole time I was working on this design thinking about that. Playing with designs in EQ has quickly become addictive. Saturday night I had to have an MRI and, as I am claustrophobic, took a rather strong tranquilizer. So as the machine made its infernal racket, rather than feeling like the walls were closing in, I was dreaming up this design. As soon as we got home, I started playing with it in EQ. I guess you could say I am now well and truly hooked on Electric Quilt. I love that I can try out my ideas and see how they’re going to look before I start printing shapes on my fabrics. It’s just another great tool to have available. 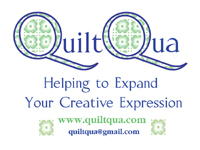 What’s perfect about it for me is that I can design a quilt using Inklingo shapes and then play with colours. 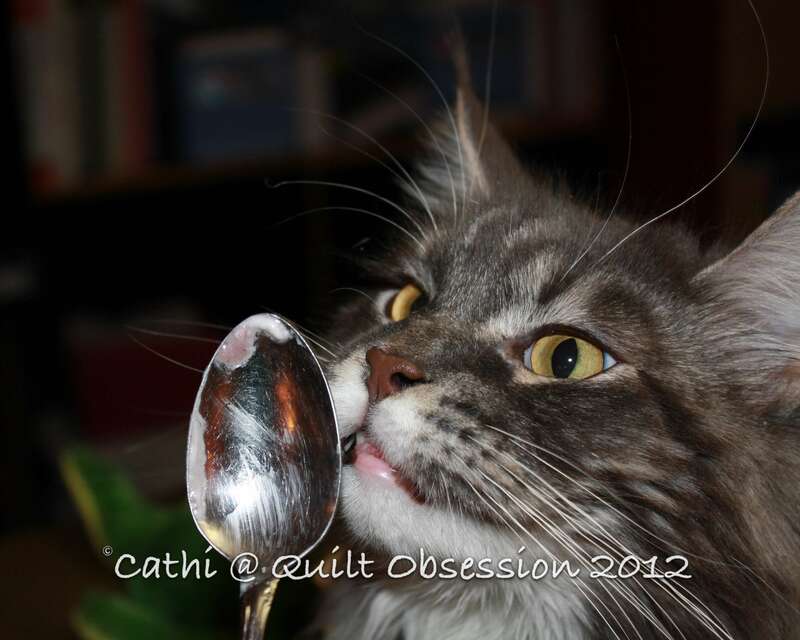 Baxter was very intent on getting to the yogourt on the spoon. If we don’t hold the spoon close enough, he’ll reach out with a paw and hook it around the stem of the spoon to drag it closer. Finishing this top was an almost bittersweet moment, as I have loved every second of working with the gorgeous Rouenneries fabrics. 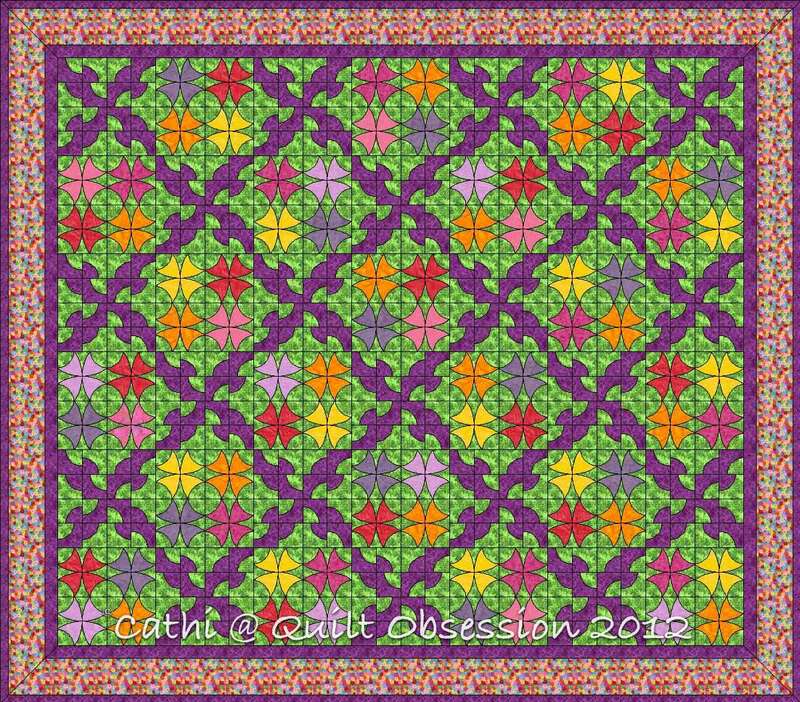 It was hand pieced, other than adding the two borders. While I generally don’t make square quilts, this one finishes at 54″ square. It’s large enough to use as a throw. I can also imagine it as a large wall hanging. 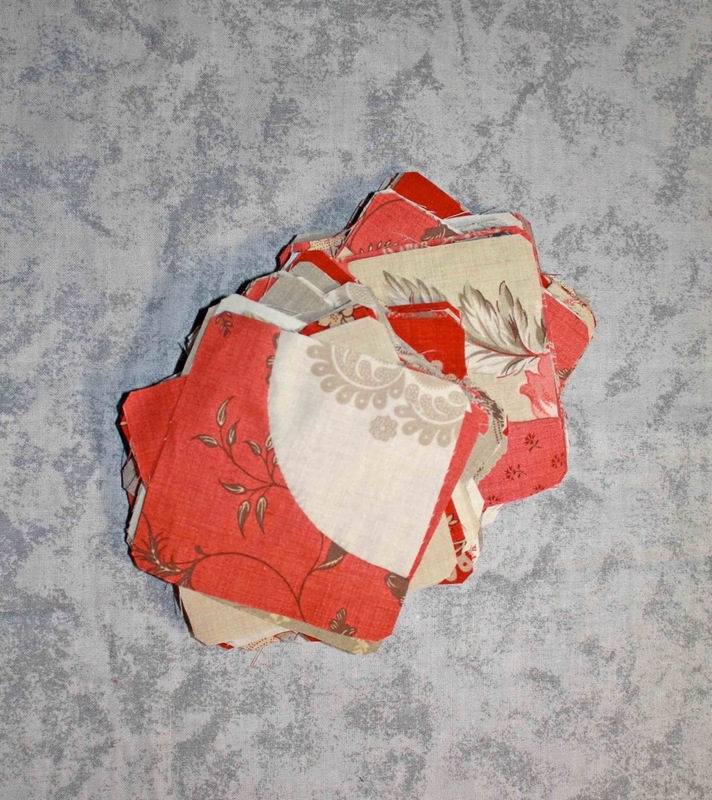 I made it from 5 charm packs of Rouenneries plus two larger pieces of fabrics from that line for the borders and used the 3″ Inklingo Drunkard’s Path collection. I know Rouenneries Deux is coming out sometime in the future, and can’t wait. Working with these colours/designs was an absolute joy. 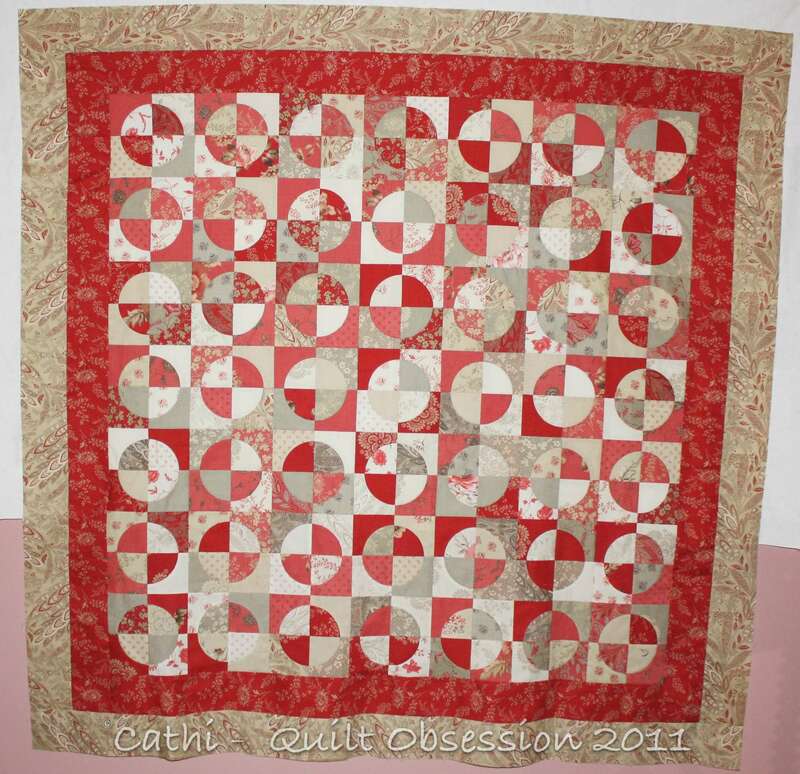 I’m thinking that a star quilt in Rouenneries Deux may just be in my future. 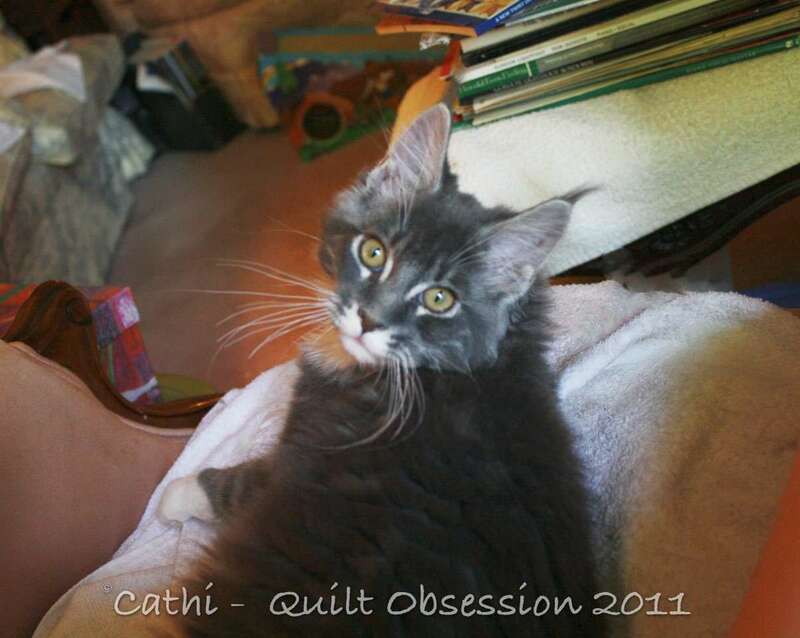 This quilt was being worked on when I finished Chintz Circles. 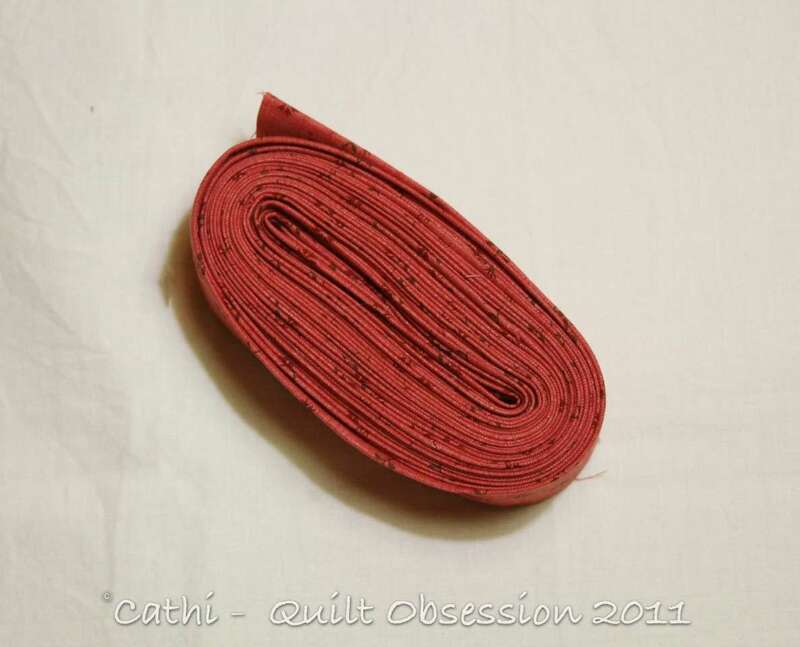 I knew I wanted to use the same binding fabric, so made enough binding then and it’s ready. 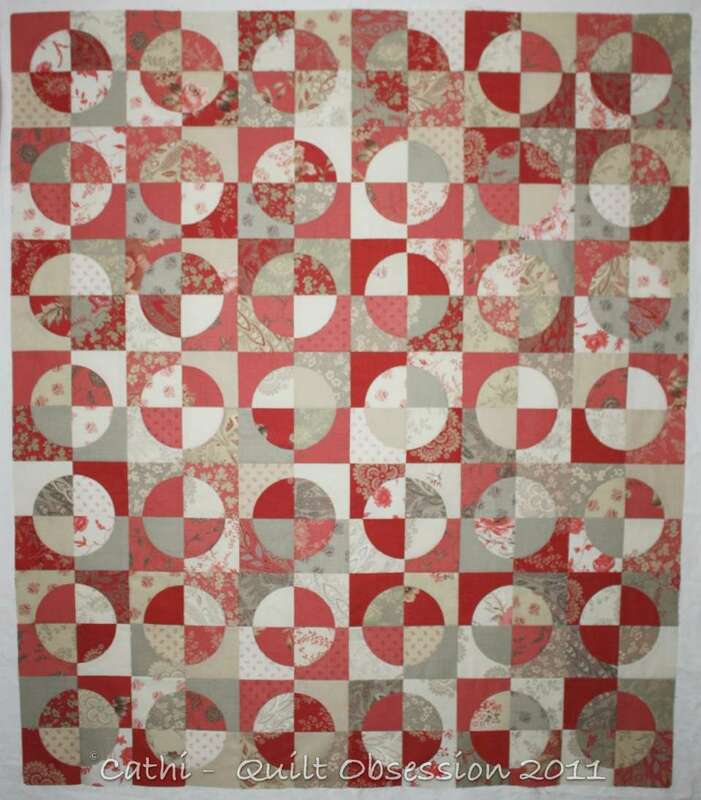 The backing fabric I used for Chintz Circles will be used for this one too. All that’s left to get is the batting and then this one will be hand quilted. And I need to find a name for it. 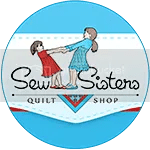 The past few nights I’ve been working on hand quilting the whole cloth quilt, but everything is going to come to a standstill for a few days while I make a quilt from the flannel fabrics I showed last week. I’ve decided on a double 4-patch. It needs to be made quickly as it’s for a friend’s brother-in-law who has just been given a rather grim diagnosis/prognosis. 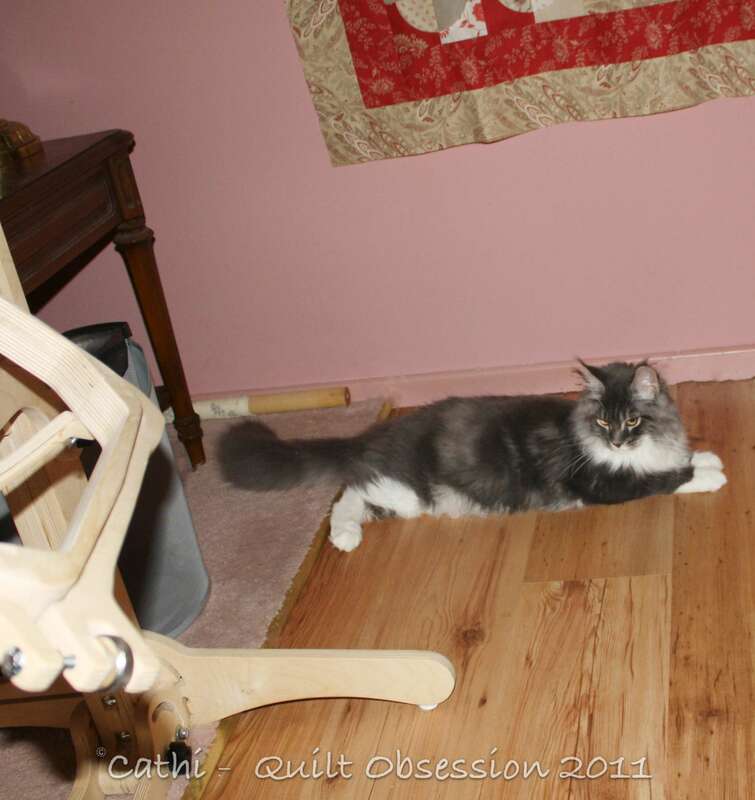 Baxter showing that he’s a real quilter’s cat – posing under the quilt on the temporary design wall, by the floor hoop. 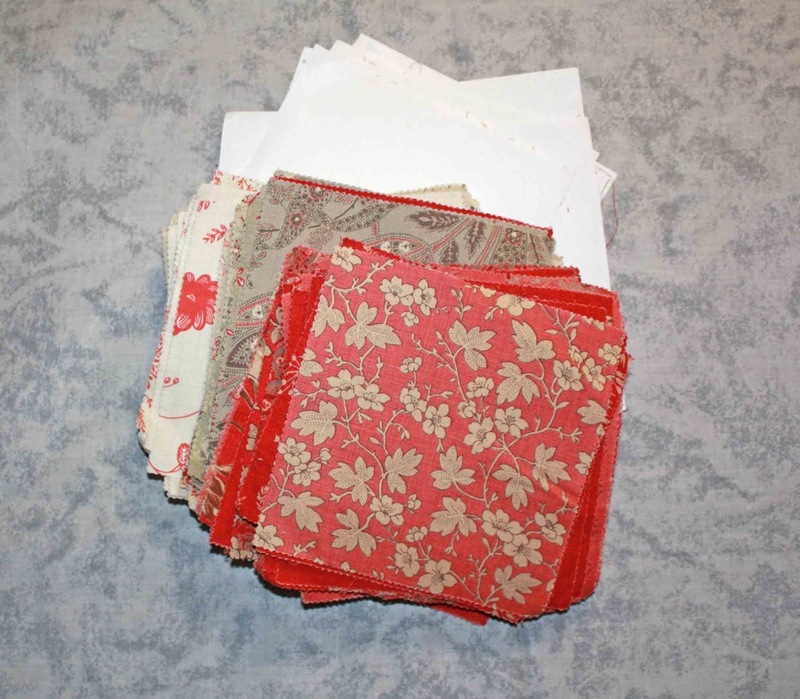 I want to make the Drunkard’s Path quilt a good-sized lap quilt, so I need to prep some more of the Rouenneries charms for printing. I already know that I can print both pieces of a Drunkard’s Path unit on a 5″ charm, so it’s a matter of ironing them on to the freezer paper that I have already cut to size and then feeding them through my printer. Here you can see that I’ve separated them by colour as I will use different ink colours for printing, depending on the fabric colour. Some of those pieces of freezer paper have been used 10 or 15 times already and are still fine for another few uses. One thing I have learned is that even 5″ charms shrink when washed and not evenly. There’s almost a full quarter inch shrinkage in width or length, depending on how you look at it, when these little charms are washed and pressed. I received the Clothworks e-mail yesterday with news of their upcoming collections and immediately fell in love with the Hungarian Blues collection that you can see here. 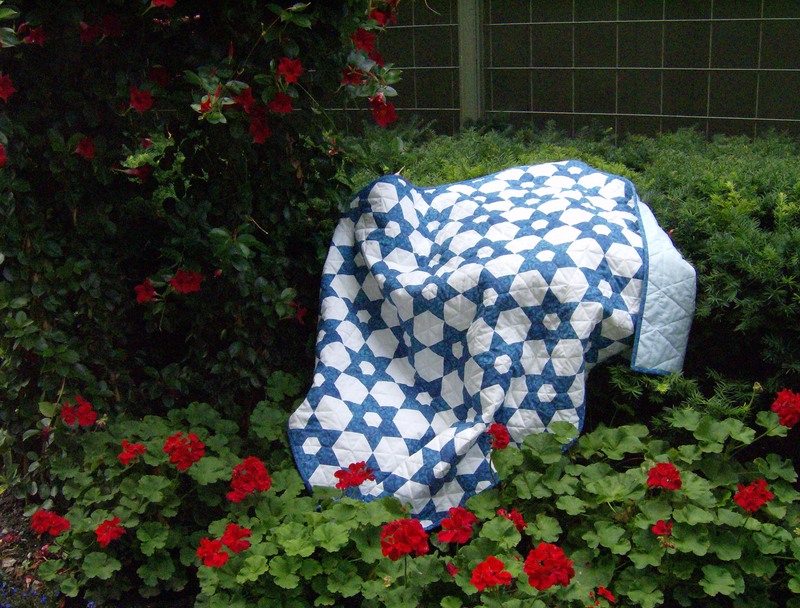 Blue and white quilts are among my absolute favourites and these fabrics are stunning. I know I’m going to want yardage of every one of those when the fabric is available. I’m already dreaming of a blue and white Winding Ways quilt or perhaps a Dresden Plate in blue and white. 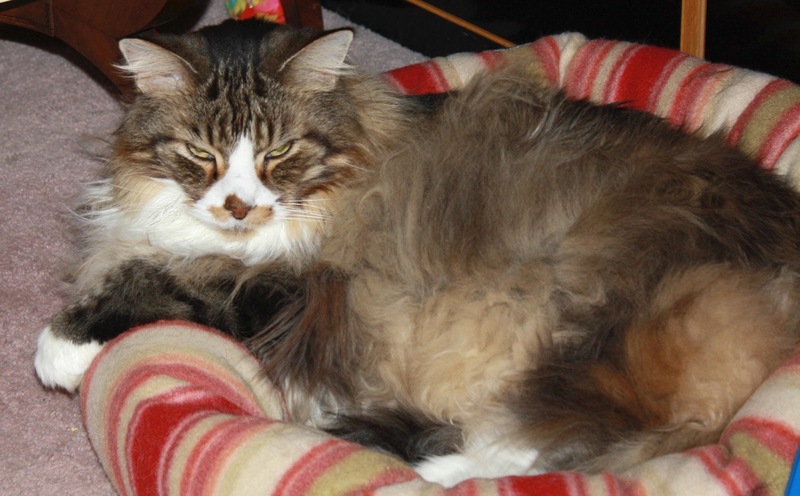 Smudge has the funniest look on his face in this photo. 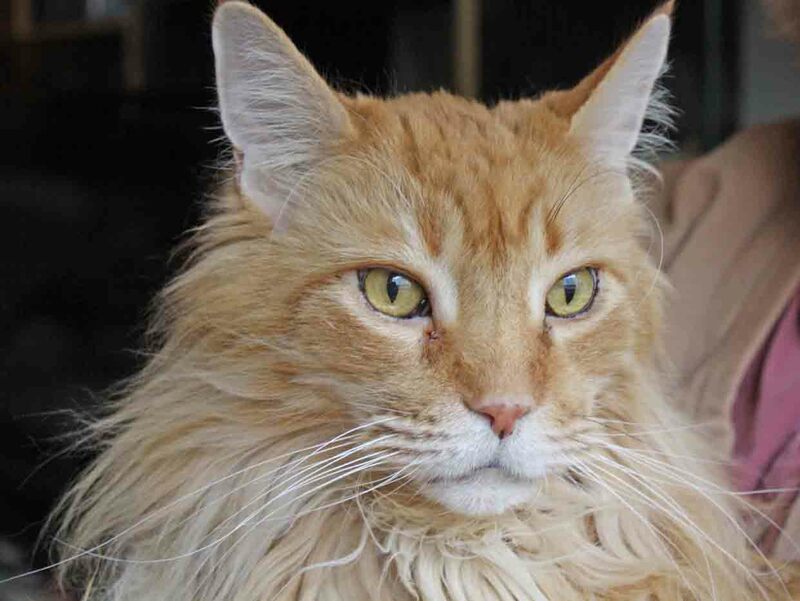 Lester, on the other hand, is looking somewhat majestic.